Part of our Thanksgiving tradition is the morning after brunch. My aunt and uncle make us a wonderful dinner, and the following morning the guests contribute to breakfast. The last two years I’ve brought a Sweet Potato Hash. The first time I tried this dish was at an office breakfast. My friend JB brought it, and I loved it. I asked him for the recipe numerous times, and he eventually shared it with me. Turns out I could have just Googled it. What makes this hash great is the bacon, and the fact that everything else is cooked in bacon fat. Hey, it’s Thanksgiving. The hash is really easy to make. The longest part is the prep work, having a good knife to cut the sweet potato is key. Once the chopping is done, the dish comes together very quickly. It’s a great make ahead dish as the flavours meld together well overnight. I’ve always had this dish as part of a brunch, but it would make a great side dish for a dinner. Cook the bacon in a large non stick skillet. Once cooked, remove the bacon pieces from the pan and drain on paper towels. Drain off some of the fat, leaving at least 2 tbsp behind. Add the onions, bell peppers, salt and pepper to the skillet. Cook until the vegetables have softened. Add the sweet potato to the skillet, then cover. 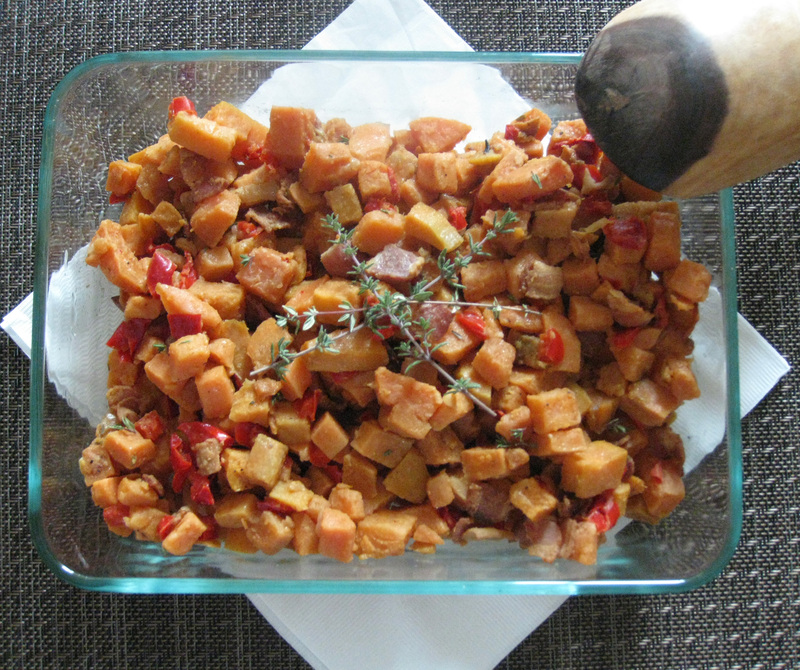 Cook, stirring occasionally for 10 to 15 minutes, until sweet potato is softened. Stir in reserved bacon and thyme. oh wow.. sounds awesome. thanks for sharing this. Creamed spinach? I mean yes, you shuold always have veggies for meals. But we can definately do without the butter, cream, cheese, and all the other unhealthy deliciousness hahaha. That whole side prob worth as much cals as the main dish! It sounds wonderful…as a side dish or for breakfast! Ah yes, you can never go wrong with bacon fat! These sound like a great Thanksgiving weekend breakfast treat. I love brunch! This is definitely a great addition to a hearty brunch menu :) Thanks! ooo yum! This sounds delicious! Love sweet potatoes! This is a sweet potato dish right up my alley–I really dislike the typical butter & marshmallow stuff people serve, but add some bacon and cook it in a skillet to brown a little, and you’ve got me. Another recipe to add. sounds delicious I can’t wait. Do you deliver?